It would be fun to play Dustforce. Too bad the Mac version broken. 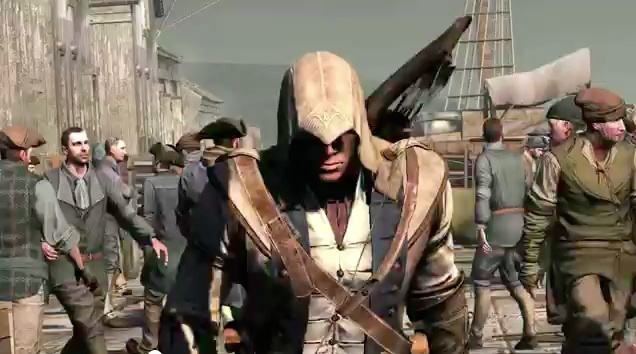 The Official Playstation Blog today posted up the trailer the world has been waiting for: the “World Premiere Gameplay Trailer of Assassin’s Creed III.” See Connor run. See Connor jump. See Connor bury a hatchet in some redcoat’s face. Wowy zowy! Who is ready to get stealthy in the snow? I know I am. The only question I have now is: where did that guy get such grippy shoes? Those tree branches are covered in slippery snow! In all seriousness, though, things are looking pretty good. It will be interesting to see how they come to terms with “being an outsider while wanting to repel outsiders” angle. That grey area will be great for being able to take down bad dudes from both sides. Plus you get to fight a bear! I look forward to seeing what kind of enemy they drum up that matches the speed of Connor, but realistically they don’t have to have speed when they all have guns. I will also enjoy looking on at battles and seeing how ridiculous standing in lines and shooting at each other really was. A NEW MASTER ASSASSIN – As Connor, a Native American Assassin, unleash your predatory instincts to stalk your enemies and devastate them with new weapons including tomahawks, rope darts, firearms and more. IGNITE THE FIRES OF REVOLUTION – Fighting from Lexington to Bunker Hill, you are America’s first highly trained Master Assassin. Incite the revolution by working behind the scenes along with historical icons like George Washington, Benjamin Franklin and more. EXPLORE A BRAVE NEW WORLD – Pursue your enemies through massive environments, from bustling city streets to blood-soaked battlefields, and into the far reaches of the American frontier. STUNNING NEW ENGINE – Experience the power of Anvil Next, Ubisoft’s new engine designed for Assassin’s Creed® III. Revolutionary physics, animation and weather systems deliver unprecedented realism, while a whole-new combat system delivers more intense, gut-wrenching battles than ever before. INTENSE MULTIPLAYER – The acclaimed multiplayer system returns with a host of refinements, including all-new characters, maps and modes to deliver the most compelling online experience yet. Get your tri-corner hats ready for this fall. ACIII comes out on October 30th. If John Adams doesn’t make an appearance in this game I’m going to be pissed. If George Washington doesn’t save none of the British children, I will be pissed.